Do you know the Tapas and Flamenco Tour of Home Hostels Valencia? Every Tuesday and Sunday starts the Flamenco and Tapas Tour from Hôme Hostels Valencia through the city center. 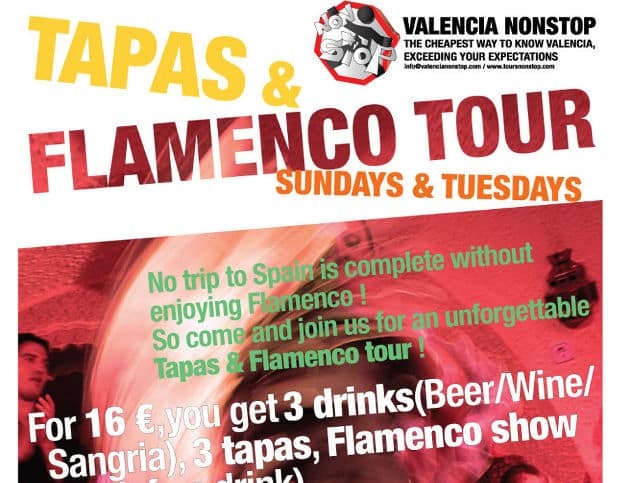 The tour includes Tapas and Flamenco shows at different places in the old town of Valencia very close to Hôme Hostels Valencia at the Carmen neighbourhood. For 24 Euros you can join as well the bar tour in the city center. Our low cost hostels in Valencia: Home Youth Hostel and Home Backpackers Hostel are centrally located at the heart of Valencia city. They are just a few steps from the main places to visit in Valencia such as the Silk Market (Lonja de la Seda) or Central Market (Mercado Central). The hostels are budget accommodation with free in-room lockers, free internet. They have cheap bunks bed dorms but if you do not like bunk bed dorms go to Home Youth Hostel placed in the Carmen Neighbourhood, city centre of Valencia without bunk beds!!! Home Hostels Valencia are like Valencia Inns but cheaper and with more services like free linen and free internet. Our low cost hostels are located in the best areas of Valencia like the Carmen Neighbourhood, full of young people. If you are an international traveller looking for cheap accommodation in Valencia come to our low tariff hotels and enjoy the best of Valencia! !